No visit to Ireland is complete without a visit to Blarney Castle! On this full-day trip from Dublin you'll kiss the famous Blarney Stone, walk through the castle grounds and hear the moving story of Ireland's emigrants at the Queenstown Story in Cobh. Traveling by train and coach, you'll take a journey through Ireland's rich history and scenic countryside. Departing from Dublin Heuston Station, you'll catch the train to Cork (full breakfast service available onboard). 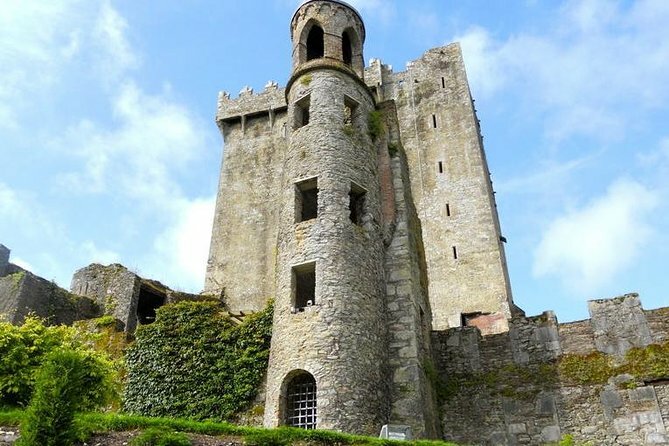 From Cork, you'll travel by coach to the famous Blarney Castle. There will be time here for you to kiss the famous stone and thus acquire the gift of eternal eloquence. Enjoy some free time for shopping and lunch in the village of Blarney before returning to Cork for a short city tour. You'll then transfer to Cobh where the Queenstown Story Heritage Center is located in the beautifully restored Victorian railway station and transatlantic terminal. This was the embarkation point for generations of Irish emigrants from famine times to recent years. Wheelchair accessibility: As long as the passenger has some mobility then this tour would be suitable. Trains in Ireland are wheelchair friendly however buses/coaches are not. The guest would have to be able to climb the steps on to the bus. Mobility Scooters cannot be accommodated on this tour.